Don't you just love old book pages. There is just something about the old fonts and fragile pages. And you can make some really cool projects with them. 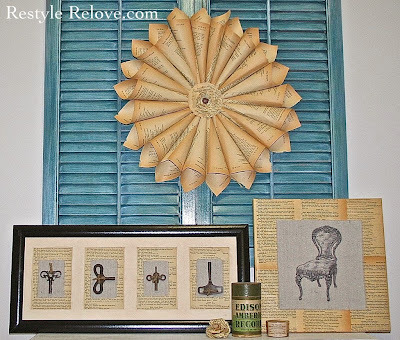 I whipped these 4 projects up in one day, all using old book pages and materials I already had. I love the way this wreath turned out. 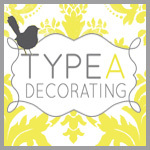 My inspiration was derived from a project I saw at Thrifty Decorating's blog. 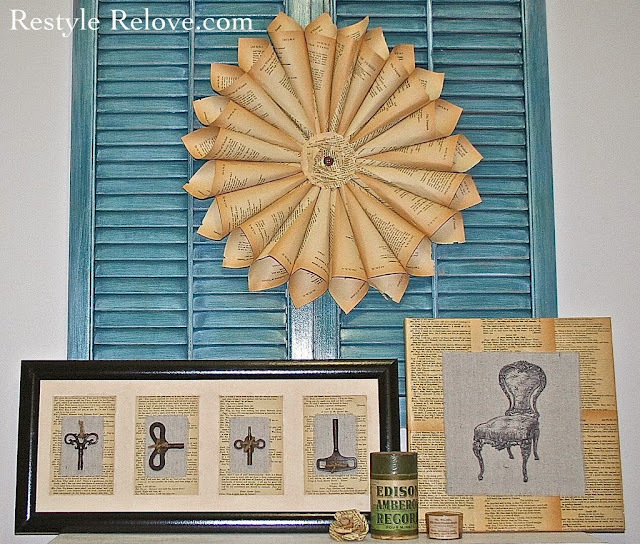 So to start I used 12 old book pages rolled and glued into cones. Then shaped into a circle and hot glue gunned to a wooden tapestry ring. Then I used small circles of paper scrunched and layered to form a flower, then hot glue gunned to the centre and topped off with a cute button centre. I finished it off with a loop of twine on the back for hanging. These very old gorgeous clock keys were given to me by my dad and I have been trying to decide the best way to display them. I had a photo frame with 4 picture inserts which I spray painted black. Then I removed the glass and fitted old book pages into the back of each photo insert. I decided to make the cardboard mat look more aged by staining it with tea. This was a first attempt at tea staining and I'm happy with the outcome. It really gave the cardboard an aged effect. I then glued the matt to the wooden backing on the back of the frame to seal in the pages. I cut some drop cloth into rectangles the size of the keys and hot glue gunned them into each insert. Then I tied twine to each key and then each key was glue gunned to each piece of drop cloth. I saw similar canvasses recently on Pinterest, but can't find them now to give the proper credit. This was another super easy project to make. 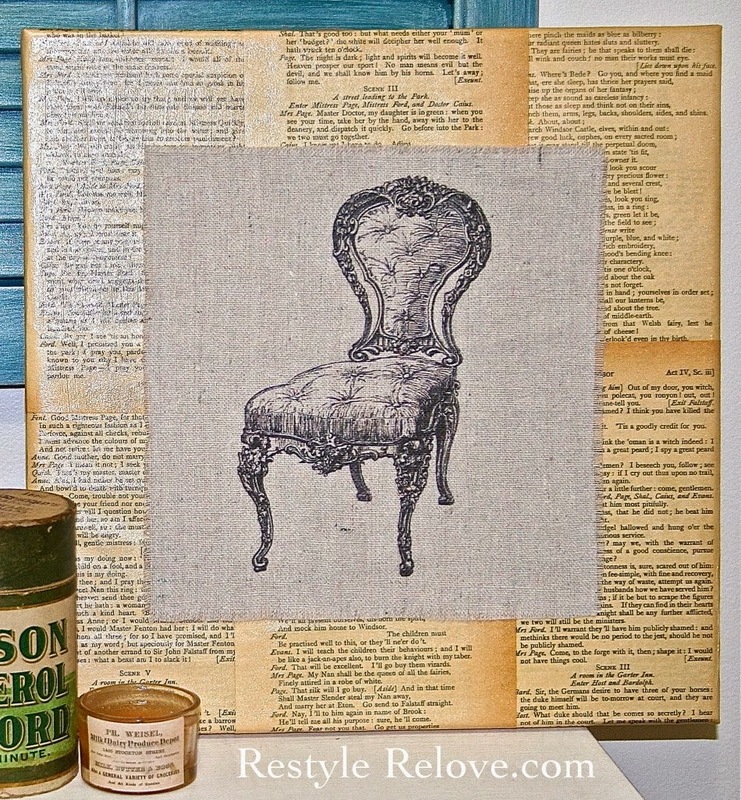 I simply used Modge Podge to glue my pages to the canvas and applied a top coat to seal them. Then I found a cute graphic at Graphics Fairy of this gorgeous vintage chair. I used fabric adhesive to attach a piece of drop cloth to an A4 sheet of paper, then put it through the printer. I love using this method to print on fabric. I removed the fabric from the paper and trimmed it into a square and glued it to the centre of the canvas. I had pinned this project from Market Nine Home. And I've been wanting to attempt it for a while now. Mine rose is not perfect, but I'm happy with the result and will no doubt find somewhere to display this cute little one. And will be making more in the future. Very nice...I love these projects! I've got the old books but I've never done one yet! Thanks for sharing at the Rock 'N Share! I'm sharing your post on my FB page today! I love those keys. Are they clock keys? Sweet. Oh my gosh...you are so creative. I love these projects. 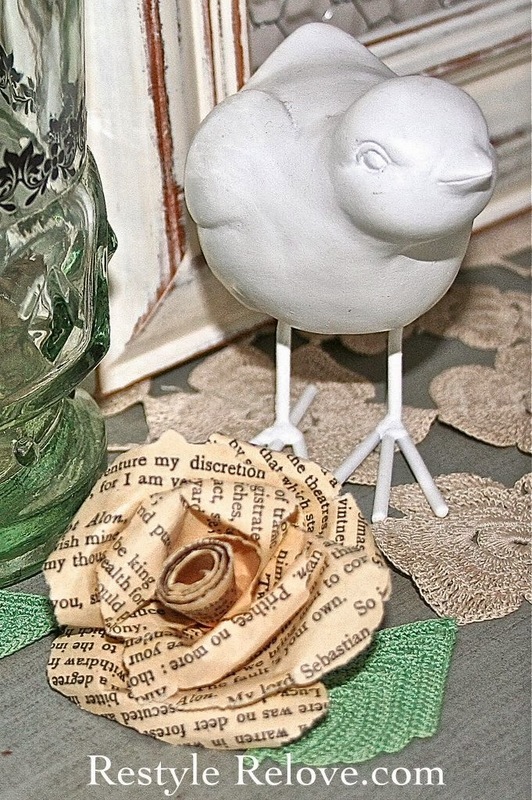 The paper flower wreath is my favorite! These all came out wonderfully!! Blessed to have found your blog! These are so cute. I love the sentimental value of the piece with the keys. Did you ink the pages before you put them on your canvas? Love this! Hiya! I love me a book page project (or four!) I'm a new follower and looking forward to more pretties from you. 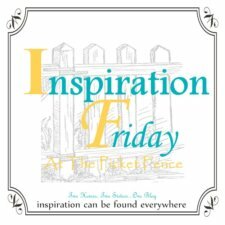 Pop over to my blog for a visit sometime if you have a minute. Great projects. 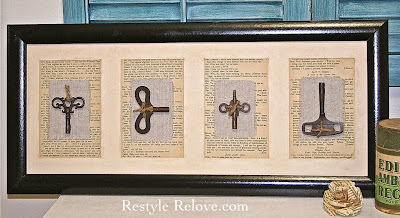 My fav is the framed keys but they are all terrific. I am Linky following. I'll be back to visit soon to see what else you've created. These are all really cute and rustic! Love the paper "wreath"! 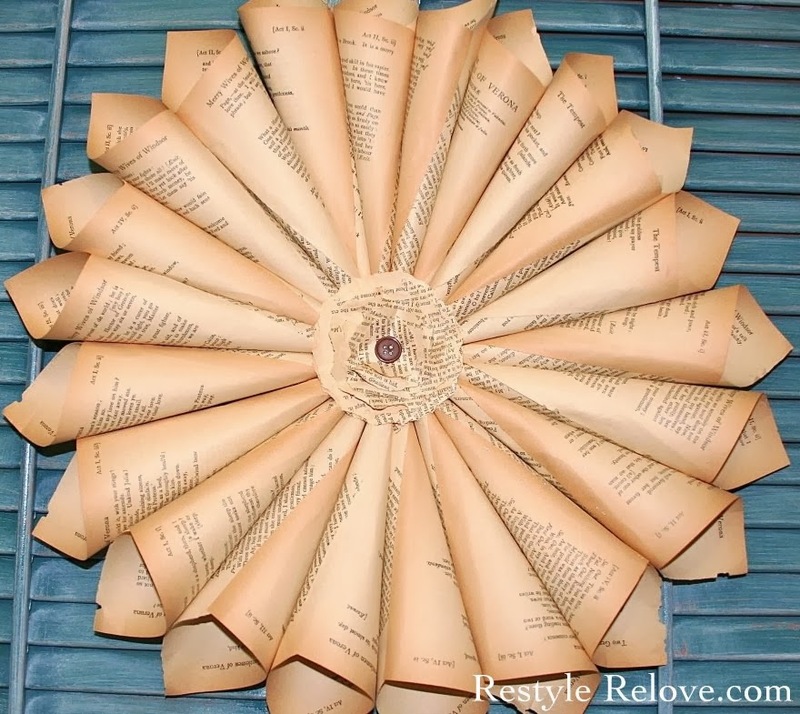 I have been looking for something to hang above the headboard that is round and this would be perfect! Thanks for the idea! I love both of your projects. I love how the wreath pops off that blue shutter! I love all of these fabulous projects. They turned out beautifully. Such great ideas. I also love your blog header. Gorgeous!! love them all. i have a wreath like this, so fun. the clock keys are great, i may have borrow that idea. Great job on all of them, but I really love the rosettes! 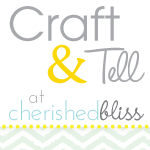 Thanks for linking to Simply Klassic Sunday - I've pinned your project and will be featuring it on Saturday! 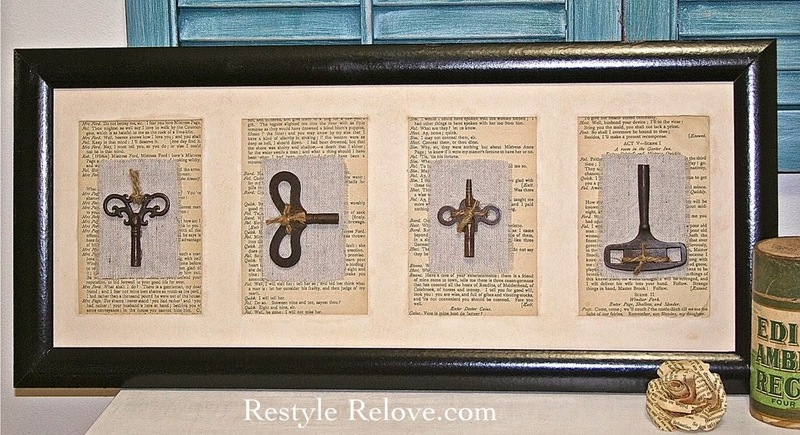 I love all of your projects especially the framed clock keys! All of your book page projects are gorgeous! I am determined to make one of those wreaths with some vintage song sheets, I know I will love it.